Droughts have struck food-producing regions in the United States, Russia, China, North Korea, and South Korea, raising the prospect of higher commodity prices and localized food shortages. 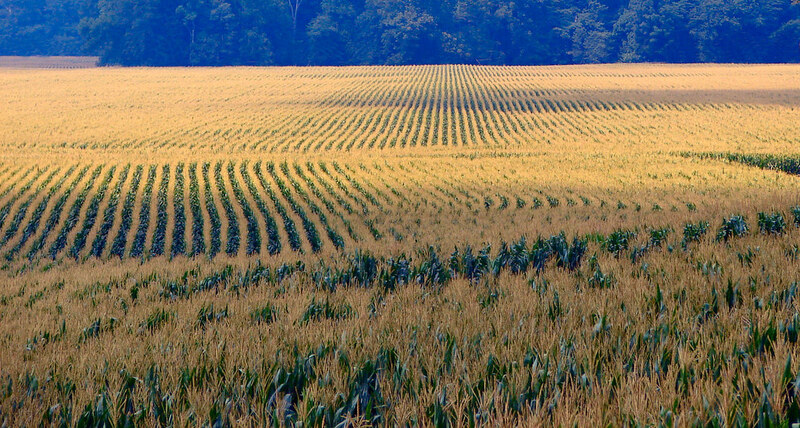 A drought in the Midwest United States threatens what could be a record corn crop. U.S. farmers planted 39 million hectares (96.4 million acres) of corn this year, the most since 1937. 7/12/12 UPDATE: Estimates for U.S. corn production dropped 1.8 billion bushels (46.2 million metric tons) from last month’s projections to 12.97 billion bushels (330 million metric tons), and the expected corn yield per acre is down 20 bushels (0.5 metric tons) to 146 bushels (3.7 metric tons) per acre, according to the latest World Agricultural Supply and Demand Estimates (WASDE) report released yesterday by the USDA. “Persistent and extreme June dryness across the central and eastern Corn Belt and extreme late-June and early-July heat from the central Plains to the Ohio River Valley have substantially lowered yield prospects across most of the major growing regions,” the report said. U.S. corn export estimates were also reduced 300 million bushels (7.7 million metric tons), and global coarse grain supplies are expected to be 47.6 million metric tons lower than previously projected. In response, the average farm price for corn in 2012-13 is estimated at $US 5.40 per bushel ($US 210.38 per metric ton) to $US 6.40 per bushel ($US 249.34 per metric ton), up from June’s estimates of $US 4.20 per bushel($US 163.63 per metric ton) to $US 5.00 per bushel ($US 194.80 per metric ton). 7/10/12 UPDATE: The condition of the U.S. corn crop continues to degrade, with 12 percent now rated ‘very poor’ and 18 percent rated ‘poor,’ by the latest USDA Crop Progress report. These numbers are up from 7 percent ‘very poor’ and 12 percent ‘poor’ the previous week, when this story first published on July 6, 2012. Little drought relief is seen this week, pushing corn prices to $US 305.22 per metric ton ($US 7.75 per bushel) Monday on the Chicago Board of Trade, a 30 percent increase over June 25. Wheat, soybean, and corn crops have been damaged by dry weather across three continents. Official production estimates have remained largely unchanged, but the dry weather has worried investors and threatens to create food shortages in North Korea. The droughts come at the tail end of a La Niña weather pattern — declared neutral in late April — and ahead of tentative forecasts for a developing El Niño that could further roil agricultural markets. High temperatures and a lack of rain are withering corn stalks in the Midwest breadbasket of the United States, and dry conditions are expected to continue until early fall. The U.S. Drought Monitor for June 26 showed that 71.13 percent of land in the Midwest is abnormally dry. Of that, 45.76 percent is in moderate drought (up from 37.84 percent the week before), 15.27 percent is in severe drought (up from 11.96 percent) and 5.28 percent is experiencing extreme drought (up from 3.49 percent). This has left 24 percent of Indiana’s corn crops in poor condition and 12 percent in very poor condition. The state has received only 95 millimeters (3.75 inches) of rain from May 1 through June 24 — 48 percent of normal, but well ahead of the record-low of 57 millimeters (2.26) inches that fell in 1988, according to the Indiana Crop and Weather Report released by the United States Department of Agriculture (USDA). “Producers are concerned about corn pollination as the crop begins to tassel under very dry conditions,” said the report. The national outlook for corn is better, however, with only 10 percent of the crop rated ‘poor’ and 4 percent rated ‘very poor,’ but the amount receiving ‘good’ ratings dropped from 52 percent to 45 percent between June 17 and June 24, according to the latest Crop Progress Report released by the USDA. Kentucky, Tennessee, and Missouri, with 18 percent, 17 percent, and 17 percent of the corn crop rated as ‘poor’, respectively, join Indiana as the states with the most severely stressed crops. Official estimates still expect the U.S. corn crop to reach a record high, but the dry weather has made investors jumpy. Corn prices on the Chicago Board of Trade rose 40 cents on June 25 to $US 5.94 a bushel ($US 218.26 per metric ton), Agriculture.com reported. The U.S. Seasonal Drought Outlook predicts that drought conditions will persist or expand throughout the Midwest into September 2012. Wheat prices are also expected to remain high, due in part to a drought in Russia. The USDA World Agricultural Supply and Demand Estimates (WASDE) places the average price per bushel at a record $US 7.25 ($US 266.39 per metric ton) for 2011-2012 and predicts an average price of $US 5.60 to $US 6.80 per bushel ($US 205.76 to $US 249.86 per metric ton) for 2012-2013. Meanwhile, the latest production estimates for Russia, a major exporter, are down 3 million metric tons “due to a continuation of spring dryness in key winter wheat producing areas and indications of crop development problems resulting from winter freeze damage.” Dry weather hit southern Russia in April and May, damaging winter wheat crops. Rains later eased the region’s drought, but they came too late to improve crop conditions. The WASDE report lowered global wheat supply estimates for 2012-2013 by 7 million metric tons. While the droughts in Europe and the United States are impacting commodity markets, droughts in Asia are creating localized food shortages, with the most severe effects being felt in North Korea. Reports suggest that areas of the country, as well as parts of South Korea, are experiencing the worst drought conditions in more than a century. North Korea has struggled to feed its population during past droughts — approximately 1 million people died in a famine there in the 1990s, food supplies ran low again in 2011, and now shortages are expected again this year. “Any drop in production is likely to add to the shortfall of food supplies and worsen food insecurity in the country,” states a report from the United Nations Food and Agriculture Organization. The above graph shows a sharp decline in the condition of the U.S. 2012 corn crop in comparison to crop conditions during the previous four years. A drought and heat wave in the Midwest are responsible for the drop. A severe El Niño in 1997-1998 cost the U.S. economy $US 25 billion, according to CBS News. It also caused billions of dollars in damages to crops, infrastructure, and mining operations in Asia and Australia. If El Niño returns this year, it could significantly impact production of soybeans, palm oil, and sugar, Reuters reported. “There is a 50 percent chance that El Niño conditions will develop during the second half of 2012,” states the latest report from the National Oceanic and Atmospheric Administration’s Climate Prediction Center. According to the International Research Institute for Climate and Society, there is a 47 percent chance that El Niño conditions will occur in August, a 50 percent chance from September to December, and a 47 percent chance in January of 2013. Current ENSO conditions are neutral following the end of La Niña in April. Global Warming Apocalypse is Approaching in 2012 to 2014.